On Monday, January 8 during the opening day of the 53rd legislative session, Governor Doug Ducey provided his third State of the State Address and highlighted several issues to the audience of Arizonans and legislators. The Governor’s address noted that in 2017 the state of Arizona had many success, including the increased use of the Happy Babies program, which allows new parents to bring their young children to work so as not to miss additional time away from the office. Further, the state was recognized as a national leader in water management, a topic that is likely to be headed to the desks of the Legislature this session due to its increased complexity. Another big accomplishment is the significant decrease in cases at the Department of Child Safety, making the backlog non-existent. The Governor indicated that it is extremely important for the community to stand together and continue to cut red tape amongst our regulatory actions and streamline processes to move Arizona forward. 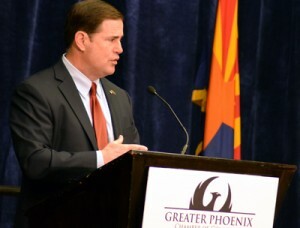 Governor Ducey expressed that his key priorities include a special concurrent session targeting the opioid crisis and the introduction of legislation necessary to limit the abuse of the drugs, as well as increasing school funding that involves reversing many recession-era cuts. He further explained his intentions to limit the practice of asking individuals to disclose if they have been previously incarcerated during the government hiring process. Removal of the “offender box” is intended to reduce recidivism and provide additional resources to increase a person’s chance of success after incarceration. Finally, the Governor thanked and recognized several heroes in our state for their exceptional selflessness and “spirit of service” for others. With only a few weeks of session completed, there are already several bills aimed at addressing public policy issues important to the business community, including many of those mentioned by Governor Ducey. Specifically, legislation focused on tackling the opioid crisis, as well as increasing public education dollars. Individual lawmakers have also shown interest in legislating hot-topics such as legal and medical marijuana, gun and ammunition control, infrastructure funding and the use of dedicated highway funds. Another key business issue will be a continued conversation surrounding the 2016 increase in minimum wage and other employer concerns, such as mandatory sick leave. The GPCC will also be advocating to ensure that businesses continue to have a voice in elections. If you have any questions about the GPCC Public Affairs process or any legislative issues, contact the team at publicaffairs@phoenixchamber.com.